This is small front rack fits most bikes with cantilever brakes. It's perfect for a handlebar bag, featuring an integrated decaleur. 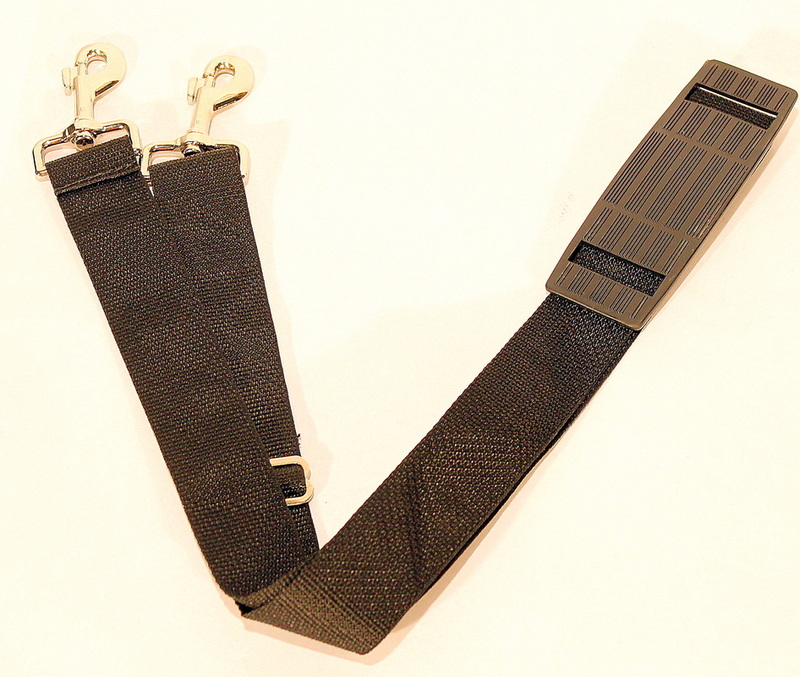 The "backstop" accepts either a U-shaped plug, or a VO decaleur bag mount (both pieces are included). The advantage to this system is your rack-decaleur combination is more solid, lighter, and less likely to rattle. Integration is the Holy Grail of constucteur bikes, and we feel that these racks a big step in that direction. 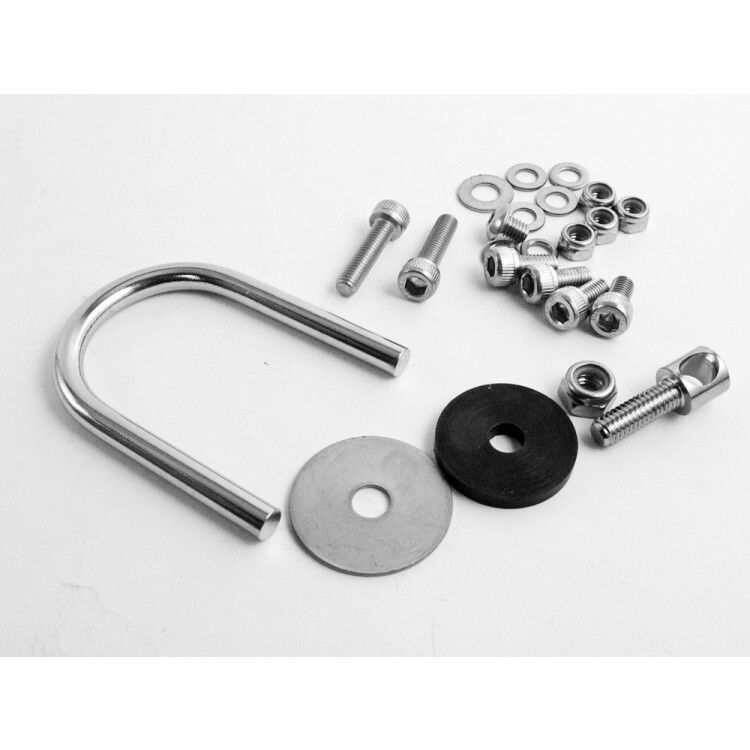 They are made from polished tubular stainless steel, and they have eyelets for lights and a fender mount. The weight is about 250gm. Most tradtional-style medium size bags work perfectly with this rack (any bag around 20cm tall), but very tall or short bags may not. Note: We've set the arm angle to fit the majority of bikes, but some frames with unusually large tire clearance may require bending the mounting arms down a little. This is the rack that we developed for our Randonneur frames. It may also be used on other bikes without eyelets on the fork blades with the included, P-clamps. 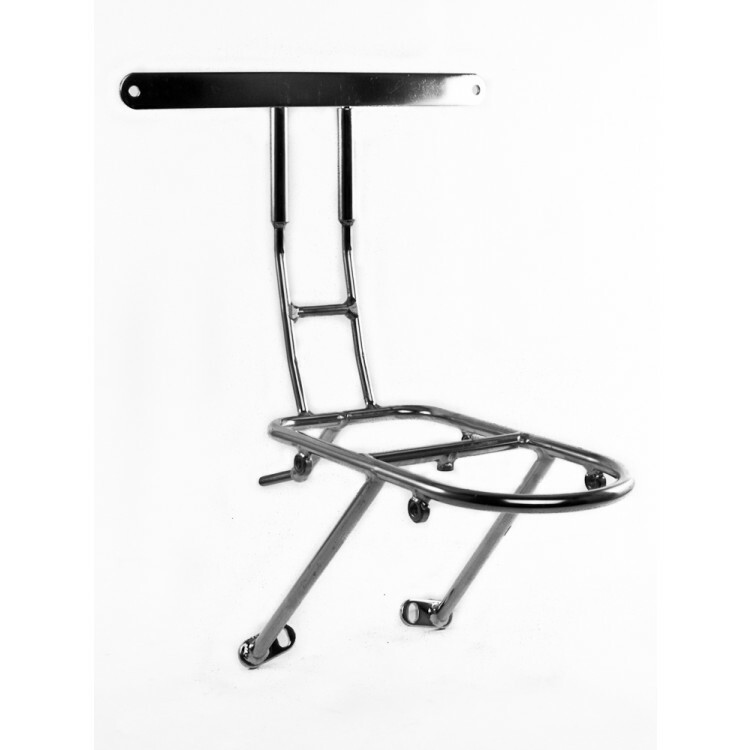 They are made from polished tubular stainless steel just like out other racks and have eyelets for lights and a fender mount. The weight is 212gm. Ideally, the tang at the back is attached to the fender boss under the fork crown, or you may use the included fork crown daruma. The tang may also be bent up and attached to the brake bolt. This rack does not mount to low-rider bosses or on canti-brake bikes. It requires eyelets on the fork blades or p-clamps. If you are having a frame built, please tell your builder that the eyelets should be about 3.75" below the bottom of the fork crown, but it's best to give the builder the rack beforehand. This is the integrated decaleur version of the rack that we developed for our old Rando frames. 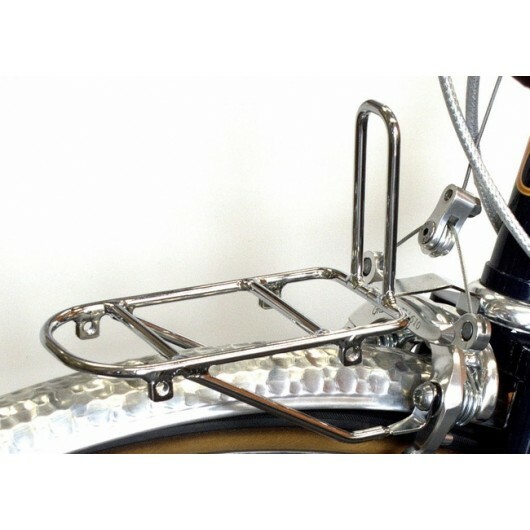 This rack is perfect for a handlebar bag. It features an integrated decaleur. 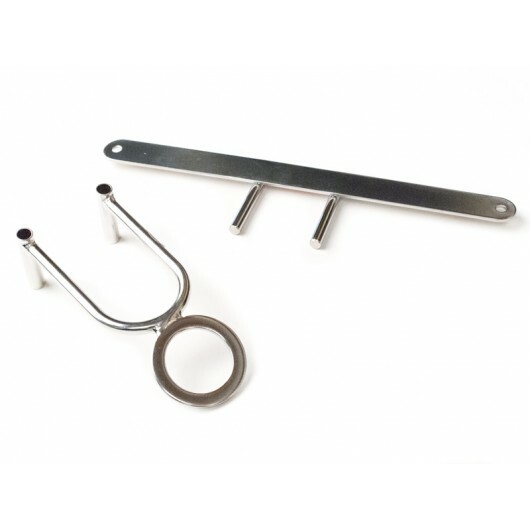 The "backstop" accepts either a U-shaped plug or a VO decaleur bag mount (both pieces are included). The advantage to this system is: your rack-decaleur combination is more solid, lighter, and less likely to rattle. Integration is the Holy Grail of constucteur bikes, and we feel that these racks are a big step in that direction. 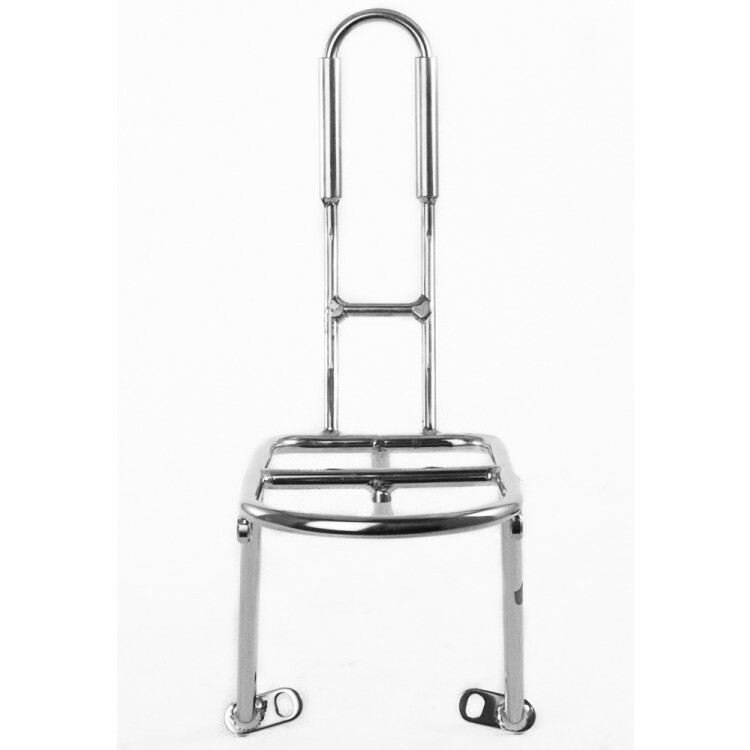 All VO racks are made from polished tubular stainless steel, so they will never rust or flake. As with our other racks, there are eyelets for lights and for a fender mount. Mounting hardware is included. This rack does not mount to low rider mounts or onto canti-brake bikes. It requires eyelets on the fork blade or the use of p-clamps. If you are having a frame built, please tell your builder that the eyelets should be about 3.75" below the bottom of the fork crown (but it's best to give the rack to the builder beforehand). 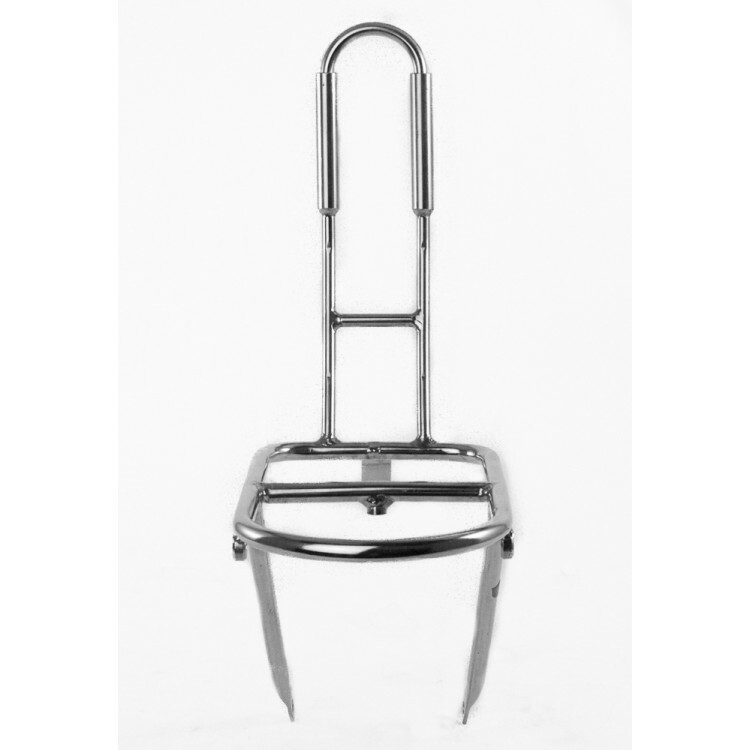 This is a small front rack that fits most bikes with canti brakes. It's perfect for a handlebar bag. 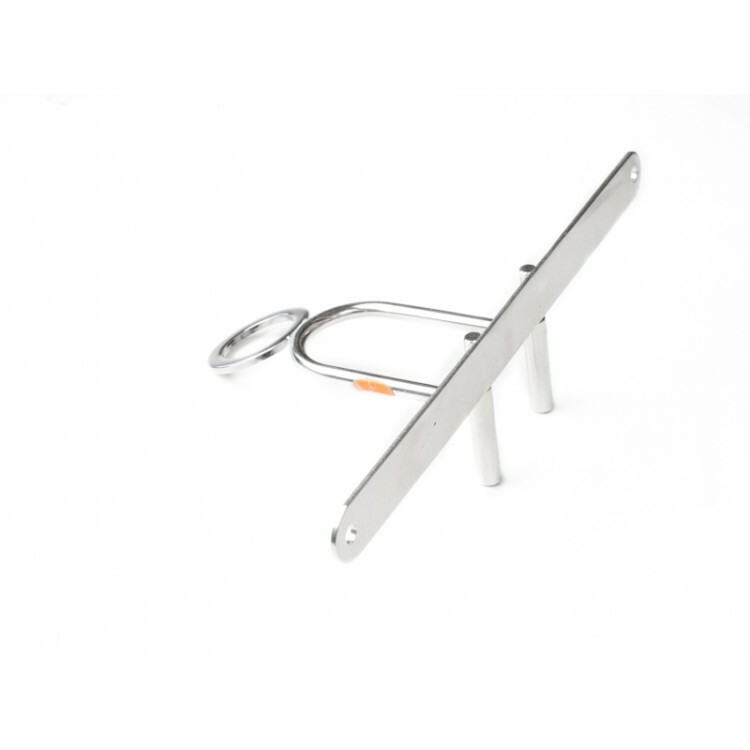 The Pass Hunter rack is made from polished tubular stainless steel just like our other racks. There are eyelets for lights and a fender mount. The weight is about 250gm. Special double-ended canti-mounting bolts are included. 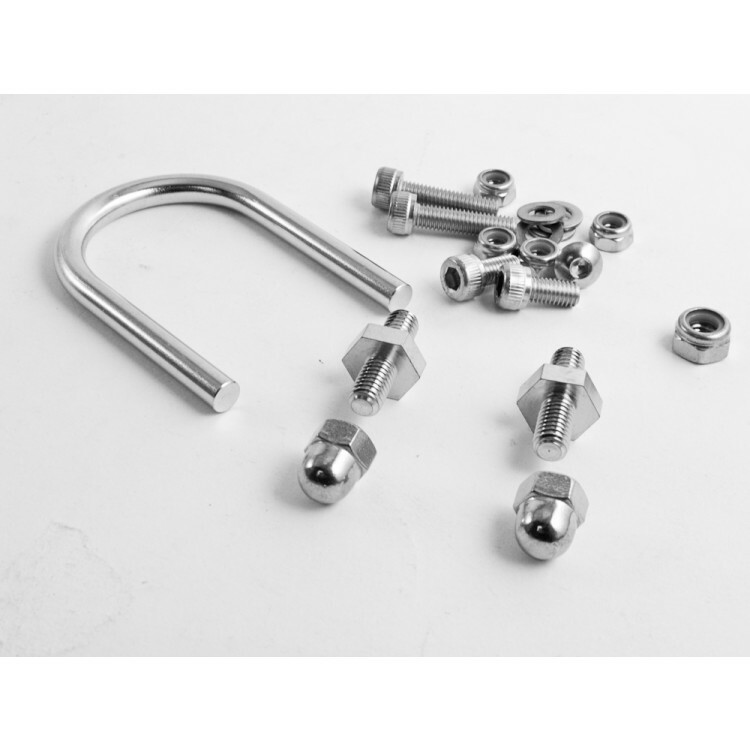 Mounting a rack to to Paul Component canti brakes requires the Paul Components rack bolts and spacers. Our decaleurs work with VO, Acorn, Ostrich, Sologne, Berthoud, TA, LaFuma, and most other traditional-style handlebar bags. Note, that these decaleurs use metric 5mm posts and receivers. The new bag mounts can be used in the old-style 1/4" receivers, but not the other way round. 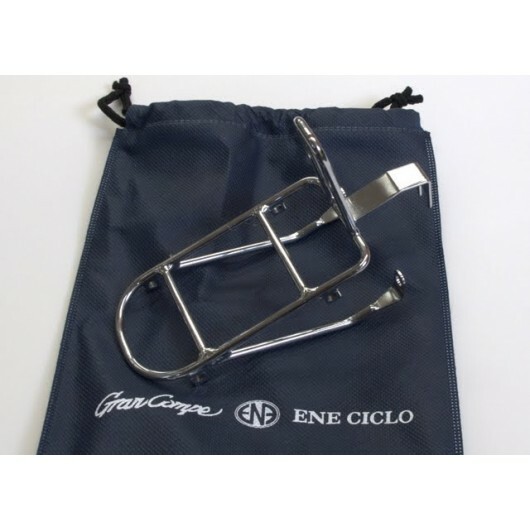 The Gran-Compe ENE racks are much like the Mafac mini-racks and are designed to support a handlebar bag. ENE racks mount directly to Gran-Compe 610 and Dia-Compe 750 centerpull brakes. There is no direct attachment to the frame so they can be used on any bike so long as the brakes fit. They are chrome plated steel and the platform is about 140mm x 70mm. The upright is about 75mm high. So they are the right size for an average handlebar bag, but too small for anything larger. There are four 5mm light mounts under the platform, two on each side. The rack sits level on most frames. At 160g these have to be among the lightest racks ever made. The tag on the rack reads, "Designed only for GC610 & DC 750 brakes". But the VO folks have tried it on several other centerpull brakes and managed to mount it on various Mafac (including Racers and Raids), Weinmann, and older Dia-Compe models. The mounting tangs are 68mm c-t-c, but can be flexed to spread or narrow a little. 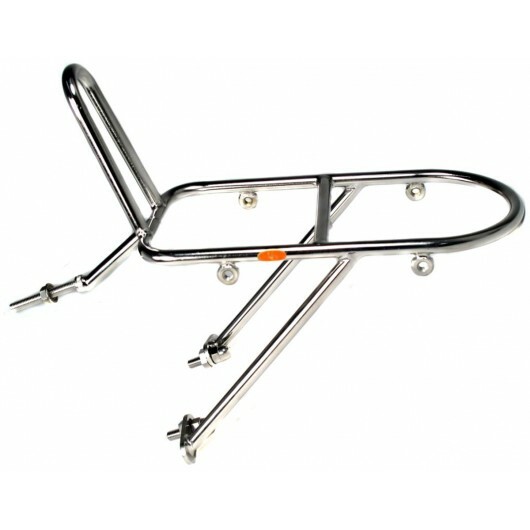 The VO Campeur front rack is designed for touring. This is a heavy-duty rack with integrated low rider platforms. The top platform features an integrated decaleur (bag quick-release) to make bag removable easy. A U-shaped plug is included for those times when you don't use the decaleur. 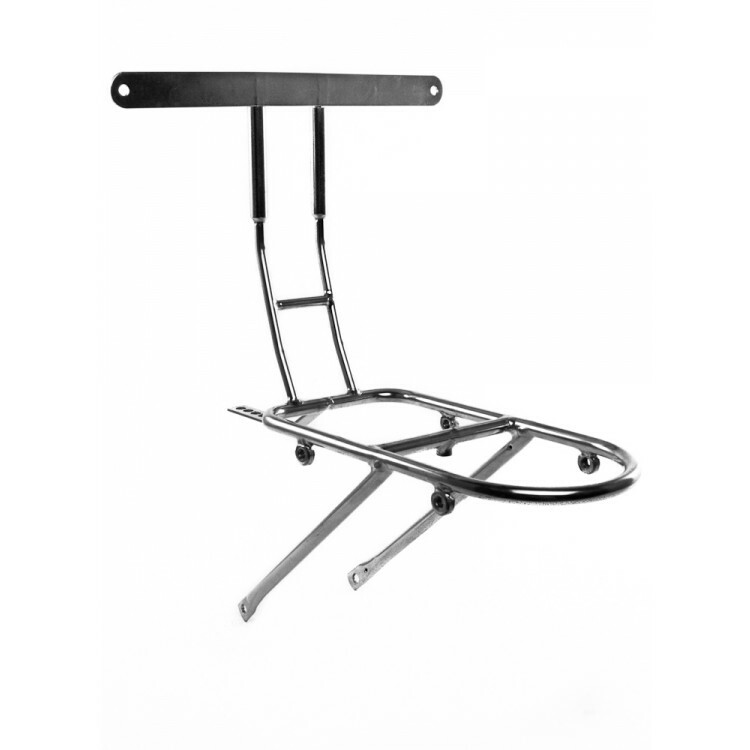 The Campeur rack is designed to be mounted to canti-brake studs and dropout eyelets. The hardware is included. It fits most bikes with 26", 650b, 700c, and 27" wheels. Construction is all stainless steel tubing with a lovely polished finish. It won't rust like painted steel racks or fatigue and crack like some aluminum racks. The VO Campeur rear rack is designed for touring. This is a heavy-duty rack with a wrap-around lower rail. The lower rail keeps weight low and allows easy pannier removal, even with the top platform loaded. 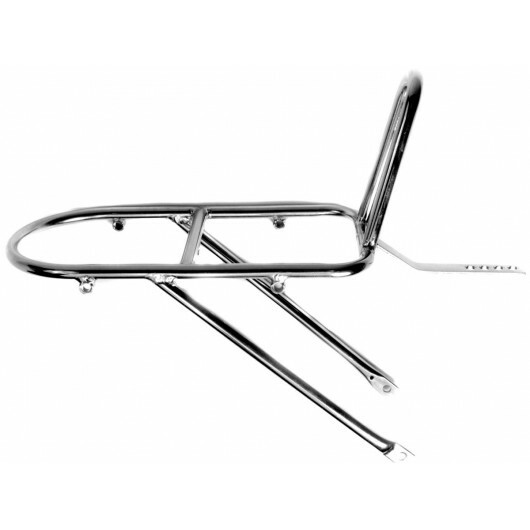 It is designed to be mounted to canti-brake studs or rack bosses on the seat stay. The hardware is included. It fits most bikes with 26", 650b, 700c, and 27" wheels. 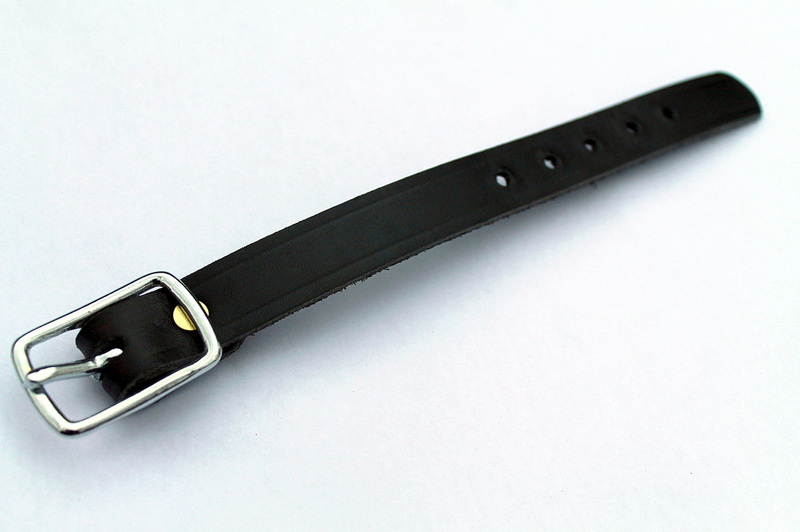 Rugged leather straps with heavy duty nickel buckles - 8.5" long and 3/4" wide. Handmade by an Amish harness maker, so they're black... but colorfully made. They're intended to be used with the Orpington front bag but fit perfectly through the Brooks saddle bag loops, so use your imagination.